Upload your case to professional process servers. Download proof of service with photo and GPS evidence. Process service for savvy law firms. Easy online ordering, instant service notifications. We validate every service against the rules in your court. Skip tracing, notary and mileage are included. Nationwide coverage with consistent performance and support. What are other legal professionals saying? I have been using ABC for many years. You are my unsung heroes. Thank you! Charles from ABC legal is awesome. He went out of his way to make sure PW got delivered the same day way up in the foothills of the cascades. Thanks, Charles! And thanks to all of you at ABC legal. Thank you all for your help in this very hectic, stressful and demanding field of law. We appreciate each and every one of you! 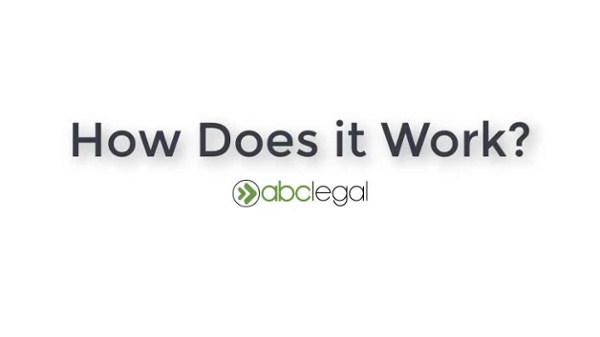 I'm a lawyer, who's used ABC Legal extensively for almost 10 years, and they provide fantastic service. It's great, as an attorney, to be able to rely on one company to serve process on numerous parties, located all over the country, in a major case. I appreciate all ABC does for me. I have total confidence in your services and feel you are the best attorney service I have dealt with in over 30 years of working in law. Looking for process servers elsewhere? Ready to increase your service rate?